Former White House strategist Steve Bannon was subpoenaed last week by special counsel Robert Mueller to testify before a grand jury as part of the sprawling Russia investigation, according to a new report. This marks the first time that Mueller is known to have employed a grand jury subpoena to get information from a member of President Donald Trump's inner circle, according to the New York Times. Bannon was named Trump's campaign CEO in August 2016 and served as the president's chief strategist from his inauguration until his dismissal last year in August. The Times cited a person with direct knowledge of the matter in its report. 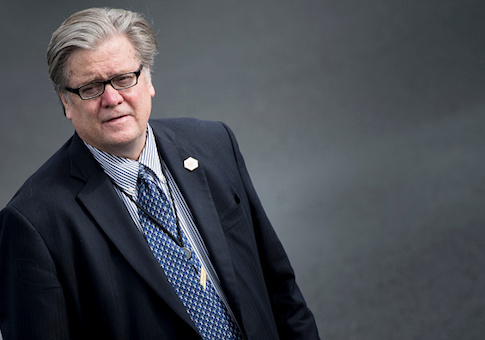 The move could be a negotiating tactic to get Bannon to agree to a less formal interview session as Mueller continues to investigate possible links between the Trump campaign and Russia, the Times reported. The subpoena could be a negotiating tactic. Mr. Mueller is likely to allow Mr. Bannon to forgo the grand jury appearance if he agrees to instead be questioned by investigators in the less formal setting of the special counsel's offices in Washington, according to the person, who would not be named discussing the case. But it was not clear why Mr. Mueller treated Mr. Bannon differently than the dozen administration officials who were interviewed in the final months of last year and were never served with a subpoena. The subpoena is a sign that Bannon is not personally the focus of the investigation. Justice Department rules allow prosecutors to subpoena to the targets of investigations only in rare circumstances. On Tuesday, Mr. Bannon testified behind closed doors before the House Intelligence Committee, which is also investigating Russia's meddling in the 2016 election and ties between the Trump campaign and Russia. Mr. Mueller issued the subpoena after Mr. Bannon was quoted in a new book criticizing Mr. Trump, saying that Donald Trump Jr.'s 2016 meeting with Russians was "treasonous" and predicting that the special counsel investigation would ultimately center on money laundering. Bannon was not directly involved with Trump's firing of former FBI Director James Comey or his eldest son's meeting with Russians at Trump Tower during the 2016 presidential campaign. The Times reported, however, that even Bannon's secondhand knowledge could be compared to testimony from those Mueller has already interviewed. Bannon and Trump had a falling out over the former's participation in Fire and Fury: Inside Trump's White House, the new Michael Wolff book depicting Trump as a childlike buffoon whose top aides dismiss him as unfit to lead. The book heavily quotes Bannon, who ultimately lost his job at Breitbart News after the billionaire Mercer family, his financial backers, expressed anger over his perceived disloyalty. This entry was posted in Politics and tagged Donald Trump, James Comey, New York Times, Robert Mueller, Russia, steve bannon. Bookmark the permalink.